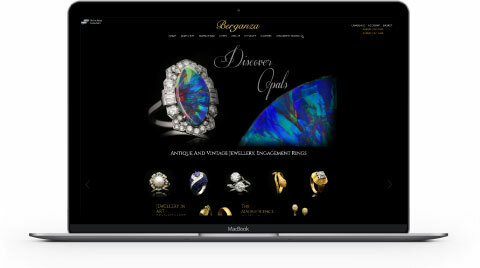 Berganza is an antique jewellery shop that sits in the heart of London. They pride themselves on grade-A customer service, are ambitious to reach new level of performance and are leading experts in their field. Their Hatton Garden store thrives on regular footfall and return custom, but they also want to utilise the power of digital marketing to gain far more traffic on and off-line. Berganza wanted Bulldog to increase their organic search rankings. This would in turn drive more traffic to the site and generate more sales on and offline. They weren't ranking anywhere near high enough for local search terms that were right within their Hatton Garden territory. Their lack of digital performance paved the way for direct competitors to race ahead online. The first thing we did is conduct an onsite audit to identify any errors that were holding back the performance of Berganza's website. We then started building a strategy to cover all the most relevant local keywords. These search terms would bring in viewers that were looking to buy, as well as drive much larger volumes of organic traffic to the brand's website. We fine tuned the brands SEO and PPC campaigns to ensure they were performing as effectively as possible. We made sure there were no broken backlinks, improved the sites loading speed, evaluated all onsite elements and checked all page content throughout the site for errors that could be impeding progress. We created infographics to use in the brand's outreach campaign. These informative pieces of content would increase the generation of links directed to the Berganza website well into the future. We made sure they were attractive to catch people's attention as well as perfectly relevant to the jewelry and fashion industry. In order to drive the most valuable traffic to the site, our team ran a comprehensive pay-per-click campaign that targeted critical keywords with high-purchase-intent while continually refining all ads to provide maximum return on investment. We accompanied all of these tasks with regular reporting to show the consistent progress we were making on all fronts.